Repatria Medica -. Medical Repatriations Services. At Repatria Medica we guarantee maximum safety and comfort. We carefully study the patients present medical condition and previous medical history. On this basis, we select the most appropriate means of transport. We offer transfers by air, land or sea and any combination of them. Follow the link to learn more about our Criteria for Transport Choice. For all patients who are medically stable. This is particularly suitable for distances exceeding 1500 km. We can make the transfer in a standard seat, a seat with extra room or in stretcher. In a standard seat: the person must be sufficiently independent to perform basic activities such as eating, moving short distances or using the toilet. According to the regulations of the International Air Transport Association (IATA), patients must not disturb other passengers with their odour, incontinence or inappropriate behaviour. In a seat with extra legroom / with an extra seat: for those who have the lower limbs affected and need to keep their legs elevated; or those who cannot bend and have to fly for over two hours. For security reasons, both during take-off and landing the patient must be able to support their feet on the cabin floor. In a bed: for patients who need to travel lying down flat because of their illness. This allows long distance travel at a lower cost and more flight freedom than a medical aircraft. 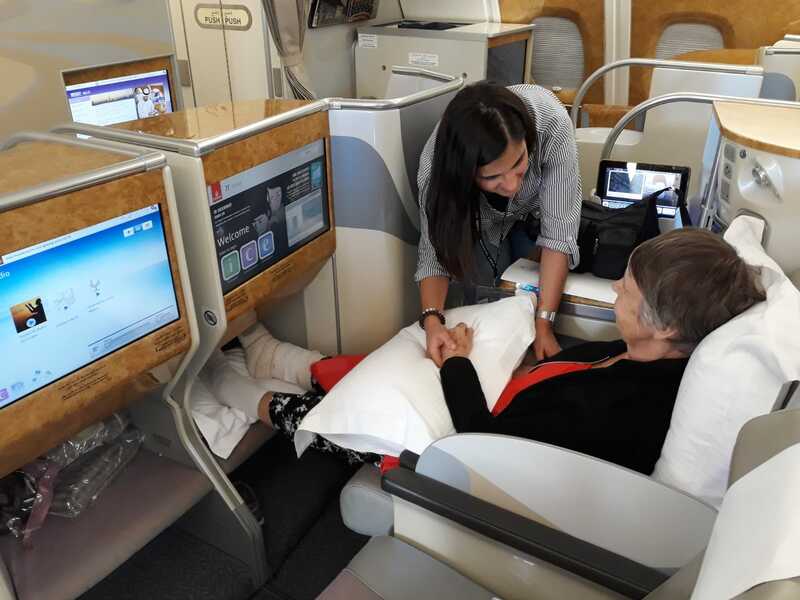 However, this does involve certain restrictions in the medical equipment which can be taken on board and commercial airlines will need more time to put a stretcher on a flight with other passengers. The treatment area of these aircraft is equipped with an intensive care unit (ICU). For patients susceptible to complications during transfer or those who need extra care and attention. Also used for patients who need to travel in a bed if there is no alternative commercial airline route available. Especially suitable when the distance between hospitals is over 300 kilometres. Depending on the patient’s need we offer transports by regular ambulance, train, minivan or car. Top of the range saloon or minivan: for patients who have suffered minor injuries affecting the upper or lower limb (except the hip), but who still have some autonomy. 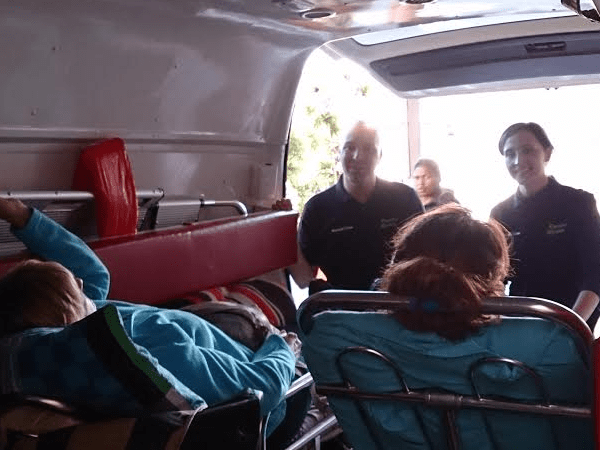 Often, these patients appreciate the comfort, stability and lightness of this type of vehicle compared to the vibrations of an ambulance. The person in charge of the fleet of vehicles has medical training and accompanies the patient at all times. Ambulance: for unstable, critical or potentially critical patients and those who need to be lying down. Train: the proliferation of high-speed rail services makes this option highly recommended for all those patients with controlled medical conditions for which comfort is a priority and for those patients who cannot fly for medical or psychological reasons. For patients who have had an accident or become ill on islands where air access is not available and those for whom flying is not advisable for health reasons. Also, for those who need to lay down flat but who aren’t in such a critical or potentially critical condition as to require a medical aircraft which is much more expensive. Among our advisers at Repatria Medica, there are medical officers of the merchant navy familiar with this environment and the possible medical facilities on board a boat. For the comfort and privacy of the patient, a premium class cabin reserved, where the patient can receive medical assistance if necessary and enjoy the comfort of a floating suite. The clinical stability of the patient: However poor the conditions in a hospital or health centre might be, the out of hospital environment is unstable by definition. Nevertheless, the teams of Repatria Medica are trained to transfer the patient with maximum safety, but never before the approval (Fit to Fly) of the issuing hospital medical team. 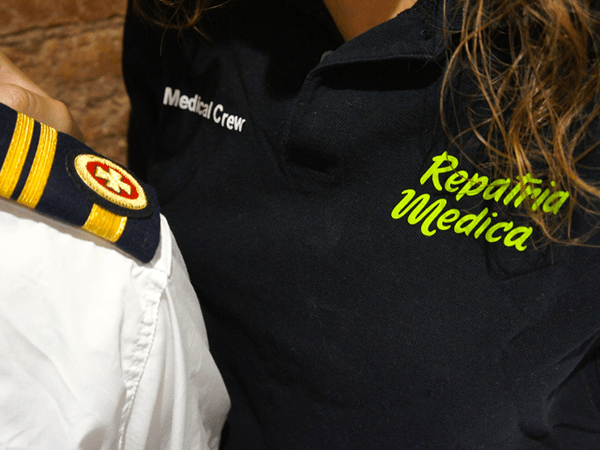 The medical condition and potential complications: Repatria Medica staff are specifically trained in emergency medicine and out of hospital emergencies, as well as in areas such as aviation medicine. A medical condition may not behave in the same way on the ground as at altitude and staff must anticipate pressure changes and know how to act at all times. For special cases, we have a board of medical speciality advisers. Time: The organisation and execution of a medical repatriation is a complex process in which many people and factors are involved. One must anticipate what is foreseeable and be prepared for all contingencies. Good planning shortens response times and minimizes uncertainty and unnecessary suffering of the patient and family. This is our commitment. Comfort: Along with clinical safety and stability, patient comfort is something that Repatria Medica is particularly concerned about. Not only do we care about the patient’s medical condition but, above all, the fact that the person who is suffering, is away from home. Consequently, in each case, we recommend the team and the procedure which would result in the safest and most comfortable repatriation possible. Logistics and economics: We know about airspace, airports and ports. With the support of our delegates we prepare the best route to optimise time and resources, according to the clinical conditions of the patient and respecting personal preferences as much as possible.